Whiskey Papa X-Ray: Happy 100th Birthday to the ARRL. 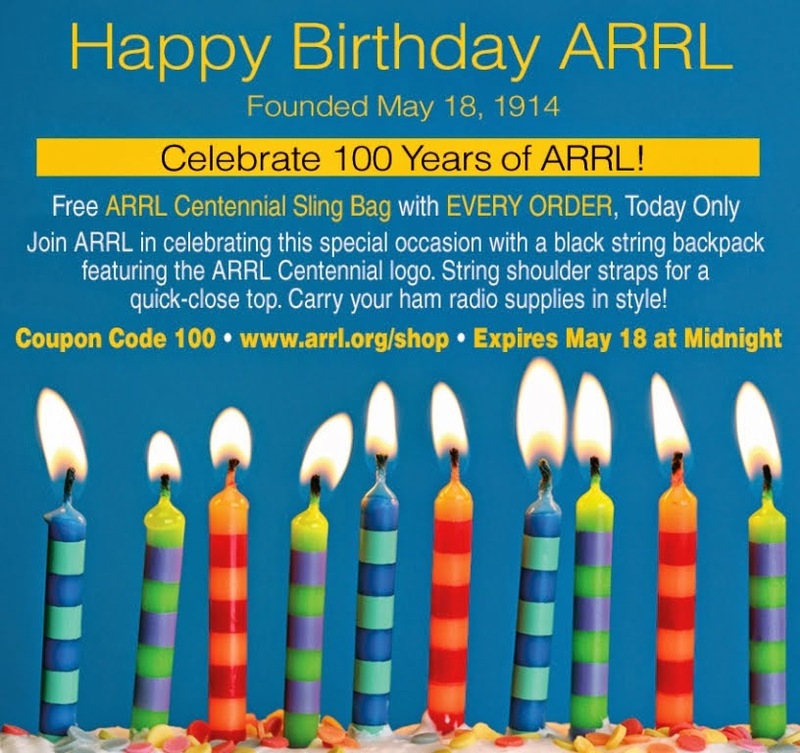 Happy 100th Birthday to the ARRL. Today is exactly the 100th birthday of the ARRL, the world's first national level organization dedicated to advancing the art, science, hobby, and public service aspects of Amateur Radio, founded on this day, 100 years ago. It was not the first local amateur radio club, or even probably the first regional amateur radio association, but it was certainly an important force in the creation and preservation of what we today know as the Amateur Radio hobby, and its early executive members were pretty important in the formation of the international IARU, and in representing Amateur interests at the ITU, and before the FCC. If there were no Amateur Bands in the USA, there wouldn't be the hobby that the rest of us, out here in Canada, and in Europe, and around the world, enjoy today. Now I know not everybody is a big fan of the ARRL. The late Wayne Green, founder and editor of "73" magazine was a famous provocateur in his editorial columns, often coming out against the ARRL whenever he could, at any angle he could manage, most often, if my reading is correct, in the 1960s and 1970s, when, according to many old-time Hams I've conversed with, the ARRL was in a bit of a rut. You could say, that a kick in the pants is still a step forward, and that the ARRL's critics have helped make the ARRL a better place. So thanks, Wayne, for your little part in that. I joined the ARRL when I got my license, even though I'm a Canadian, 90% because I like the QST magazine. I also subscribe to CQ magazine, which is the other major Ham magazine. I read both magazines online. I got a free membership in RAC when I got my license for one year, and I'll probably renew that membership too. I think organizations like RAC (in Canada) and ARRL (in the USA) are an important part of keeping the hobby ticking over well, fighting against RFI and spectrum licensing encroachments on ham bands, and representing amateur opinions and ideas at the legislative table. We live in a society governed by laws, and shared resources like the RF spectrum are not going to be carved up endlessly in our favor if we don't organize ourselves and represent ourselves and put our best foot forward. No matter how much you like or don't like the ARRL, consider that a healthy ARRL is the most powerful organization of hams in the world, and that by in-fighting, bickering, and complaining, you're only shooting yourself in your own foot. So enough of considering the critics. Be off with ye. Back to the Happy Birthday bit. 1. QST, my favorite place to find project ideas, product reviews, and other stuff like that. 2. The 2014 edition of the Amateur Handbook, is a special centennial edition, and is perhaps the best (and heaviest) edition I've seen yet. It's getting to be more an Encyclopaedia than a Handbook, but that's a nice problem to have, in my opinion. 3. The Antenna book. I've only read a loaned copy, haven't bought my own yet, but this is next on my to-acquire list of cool things that I've seen from the ARRL. 4. The large membership base gives it a voice at the table not just in the USA but around the world. This benefits me (here in Canada) and you, wherever you are, if you care about this hobby. 5. It's been a long, strange trip. I'm a History buff, I'm interested in the History of Everything and I like the historical record that the ARRL has provided. An Elmer (mentor) loaned me a bound volume of QST magazines from 1976, which I have been enjoying looking through. In 1976 people were buying channelized 2 meter FM rigs with plug-in crystals. Collins was still around as a brand-name belonging to Rockwell, which was in turn acquired by Motorola. There was very little evidence in 1976 that the microcomputer revolution was having any effect on the ham radio world, other than that HAL Communications Company would sell you an Intel 8080 single-board computer, if you wanted one. I like the old ads for Collins transceivers,because this is an ad for a rig that has the very finest 1950s tech slightly warmed over for 1976, but with zero effort to even be up to date for 1976. Did Collins ever fit an internal LCD frequency display to one of their rigs? I'd like to see it, if they did. My first real QSOs. Very fine business.